Who has time for fussing over a Christmas card when you have all that packing to do for 17 days in Hawaii? That’s why the Obamas’ 2013 holiday wishes to the nation were about as warm as the glare Michelle Obama shot hubby when he was caught up in selfie hilarity with the blonde Danish chick at Nelson Mandela’s memorial service. Thanks to the lack of color, warmth, and definition, at first glance it’s hard to tell what the card is exactly. On closer examination it’s obvious that it’s a pop-up of a starkly eggshell-colored White House featuring two relatively indistinguishable images of Bo and Sunny and a small American flag up top. 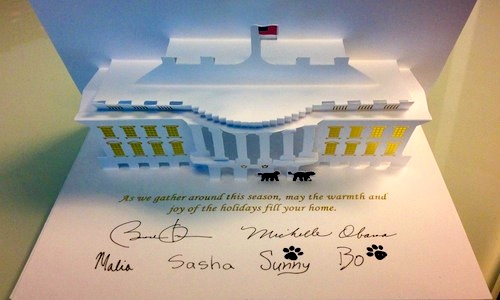 For added boredom, Barry, Shelley, Malia and Sasha, and Sunny and Bo, complete with paw prints, have adorned the card with their autographs. Other than that, there’s no holly, no Nativity, and the word “Christmas” (God forbid) is nowhere to be found. Guess the goal is to keep it secular. However, this is a White House that celebrates every St. Patrick’s Day by turning the fountain on the South Lawn green. And wasn’t it just a few weeks back that the White House was decorated to beckon in trick-or-treaters? Now for Christmas the Obamas send out a godless card with no Magi, no angels, no nothing. Although the pop-up seems message-less, to the trained eye the Obama whatever card is chock full of meaning. The White House being the focal point of a season that is supposed to be about the birth of Jesus Christ. The holidays serve as an opportunity to recall our Nation’s journey, reflect on our blessings, and to remember those who serve and sacrifice for our freedoms. It’s a season when each of us can do our part to care for one another. Sorry but the ‘stories and traditions’ balderdash screams political correctness. And the usual socialist suggestion that “It’s a season when each of us can do our part to care for one another” is not only insulting to those who care for others all year long, but also a predictable sentiment coming from a band of progressive radicals planning to spend the next three years forcibly sharing wealth that isn’t theirs. This is coming from the wife of a president who, every chance he gets, dredges up references to the racism that he thinks defines this nation, and does everything in his power to keep an “indivisible… nation under God” divided. Then to carry that theme forward, the insensitive Obamas send out a colorless, unemotional holiday card that extends greetings to a nation suffering on every front featuring two dogs that live life basking in the lap of luxury. Although the greeting says “As we gather round this season, may the warmth and the joy of the holidays fill your home,” which on the surface seems lovely, let’s remember this is coming from a family feverishly packing to leave home for the holidays to spend another $4 million ruining Christmas for every resident on the island of Oahu. 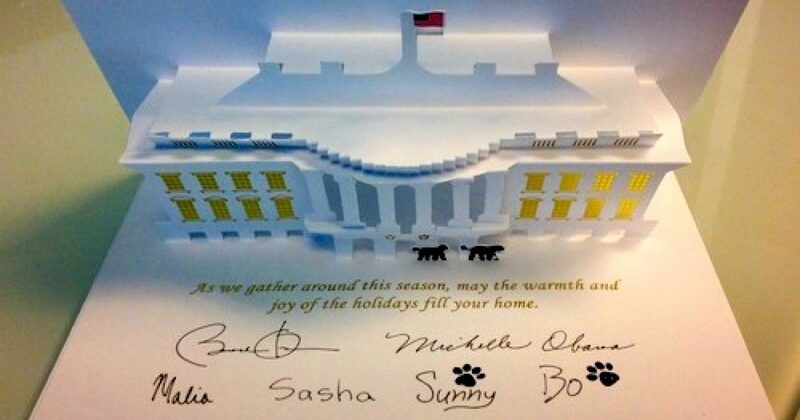 Meanwhile, amidst platitudes about “we do our part to care for one another” the Obamas will return to the White House featured in their insipid holiday card three days after the US healthcare system blows up and leaves millions of devastated Americans lying in its wake. Tell us about “caring for one another,” Michelle and Barry, and get a clue. Jesus — not the White House — is the reason for this season.